Where to Pan for Gold in Michigan. Michigan, like most states on the eastern side of the US, has a small amount of placer gold, most of it put there as glacial deposits thousands of years ago. 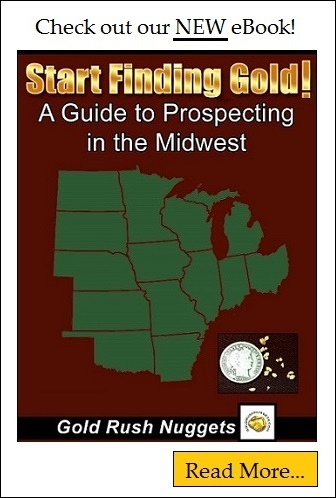 Gold can be found throughout the state, but you are not likely to find any substantial concentrations like you would in some of the more well-known gold bearing states. Both the upper and lower peninsula have produced fine gold throughout the rivers and creeks. One noteworthy area is the Ropes Gold Mine north of Ishpeming in Michigan’s Upper Peninsula. In 1881, Julius Ropes discovered gold in some rock outcroppings there, and formed the Ropes Gold and Silver Company to expand works on his new discovery. Gold mining continued for decades, changing hands numerous times until it was closed in 1991. Ore values were generally low, but new extraction methods allowed the mine to remain active (off and on) for over a century. Other lode discoveries have been made across the state, but most have been very low grade, and gold production has been a byproduct of other mineral extraction efforts. The area around Ishpeming, Michigan is worthy of investigation for the hobby prospector. In addition to the Ropes Gold Mine, reports of placer deposits occur throughout several creeks and streams in the area. This is just a partial list of rivers in Michigan that have produced gold in the past. As mentioned earlier, the nature of glacial gold deposits means that much of the gold across the state is widespread, but in very small amounts. Any waterway has the potential to hold some gold, so get out your gold pan and start searching. At the time of this writing, panning is allowed on state lands where both the surface and mineral right belong to the state. Be sure to check further if larger mining equipment is to be used.